Roughly 20% of all people will experience acute thoracic pain in their life. Clearly, this is a common problem. Many treatments exist to relieve the pain associated with thoracic inflammation. These treatments include use of medications, exercise, massage, and surgery. These vary in degree of invasiveness and amount of potential risk involved. In order to provide the best treatment possible, the least invasive option should be attempted first. This includes thoracic epidural spinal injections. Thoracic epidural spinal injections are a minimally-invasive low-risk treatment that provide effective results. 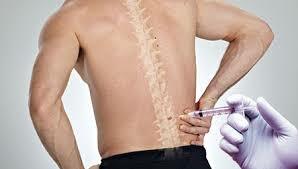 Thoracic epidural steroid injections are provided by an approved physician on an outpatient basis. This means that the treatment will be completed within the day and the patient will return home afterwards. To begin, localized anesthetic is provided around the injection site so that the steroid injection itself will not cause any pain. Once the target area is numb, the doctor will use x-rays along with colored dye, as well as patient report to target the exact tissues in need of steroid treatment. The steroids act to reduce inflammation which causes swelling and pain. Once the correct area has been located, steroids will be injected and the needle will be removed. What’s the treatment is complete, the patient is free to go. It should be noted that whenever anesthetics or sedatives are used, driving should be limited until the effects have completely worn off. The causes of thoracic pain are numerous and varied. Potential reasons include poor posture, injury, health issues, and more. Common sources for posture related thoracic pain include poor ergonomic and body mechanic technique implementation in the workplace and the car. One important and underrated risk of injury related to the thoracic spine is that involved in twisting. The anatomy of the spine allows for limited rotational movement, such as twisting. However, once this limit has been reached, further twisting or bending will cause injury. The body’s natural response to this injury will include inflammation, providing vital nutrients to the affected area. However, this inflammation also is commonly associated with swelling and pain. Therefore, movements of the entire body should be used as opposed to quick, jerking twisting motions. 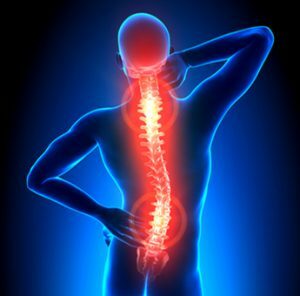 The solution to spinal pain concerns lies and the source of the problem. For those who have experienced thoracic pain in conjunction with injury or overuse, home and lifestyle modifications can be done so that further injuries do not occur. This may include something as simple as adjusting the seat in your car. When seated and driving, one should keep their feet around a 45° angle, their knees bent around a 45° angle, and their hips at a 90 degree angle with their back pointed straight. The positioning of the legs has a direct impact on the positioning and strain on the thoracic spine. In addition, massage and exercises can be provided to reduce inflammation and relieve pain. Are you ready to end your thoracic spinal pain? Call Dr. Grimm to schedule an appointment to discuss thoracic epidural steroid injections to provide you with pain relief.